Saturday is pancake day (a recipe!) - Stop staring and start sewing! 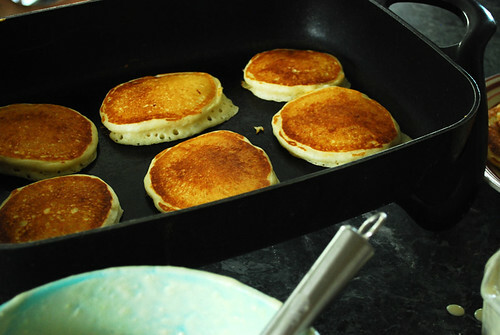 I've been wanting to share my buttermilk pancake recipe for awhile because it's the one recipe that always gets rave reviews from the kids (and adults too, but we know to be complimentary and not complain so it's more impressive coming from kids, right?). It's based on the pancake recipe in my Betty Crocker book but since I've had that book for 25 year (it's pretty gross looking and starting to fall apart) I've had oodles of opportunities to play around with it and make something a little more special that your average pancake recipe. 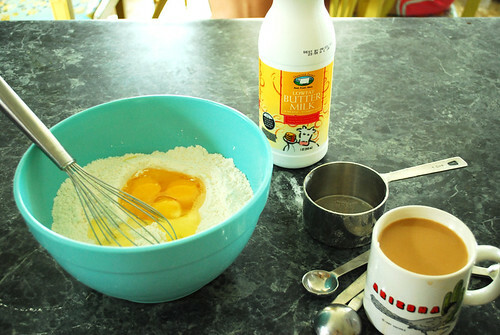 I adore pancakes and these pancakes are worthy of my adoration. I knew today was going to be a busy day working around the house so I really wanted to start everyone off with a happy, hefty breakfast. This recipe makes loads of fluffy pancakes so we usually have enough to freeze and the kids end up walking around munching on frozen pancakes the next day. I couldn't really start until Skate took care of the fly buzzing around the kitchen (see him sitting there on the buttermilk bottle in a taunting pose). We didn't need added protein since we were having sausage so the fly had to go. 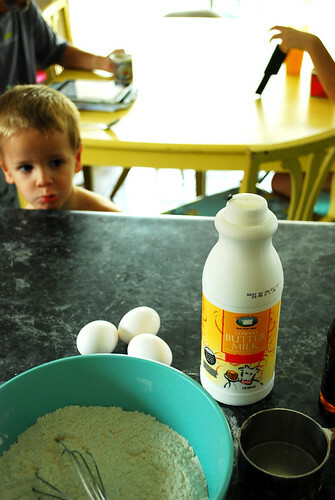 With the butter, eggs, and buttermilk you are guaranteed some really tasty results (and I'm a stickler for real maple syrup which I pour sparingly on the kids pancakes because, at that price, they're not allowed to touch it). Having a cup of Stumptown coffee right there while you're cooking can really kick it up about 20 notches though. Once the kids are fed I make some especially for Joey and myself. I try to be very discrete since I don't want to have to end up doing this for everyone next time.....once I flip them over, I add a nice dab of butter to each pancake and spread it around while it's melting. Then, when they're hot on our plates, they get a nice drizzle of real maple syrup and it's like Mrs. Buttersworth on steroids. Give it a try (download link at top of post) and have a great weekend! !